This project uses a human-borne backpack sensor system consisting of multiple laser scanners, cameras, and inertial measurment units which can reconstruct textured, 3D models of building interiors without external navigation references. I was the hardware lead on this project in the Video and Image Processing Lab. I designed and built this backpack system from the ground up and am responsible for the data collection software. In addition, I collaborate with members of the lab in developing the localization algorithms. The project was profiled on ABC 7 KGO news (San Francisco Bay Area) as well as the Daily Californian and various tech blogs on the Internet. Engadget - Laser backpack creates instant 3D maps, Venkman reminds you to not cross the streams, reported by Tim Stevens, August 11, 2010. Gizmodo - Laser Backpack Creates Instant Virtual Interiors, reported by Sam Biddle, August 11, 2010. PC World - 3D-Mapping Laser Backpack is the Nerdiest Back-to-School Item Ever, reported by Nick Mediati, August 11, 2010. Popular Science - Laser-Scanning Backpack Creates Instant 3-D Maps of Building Interiors, Everywhere You Go, reported by Clay Dillow, August 11, 2010. 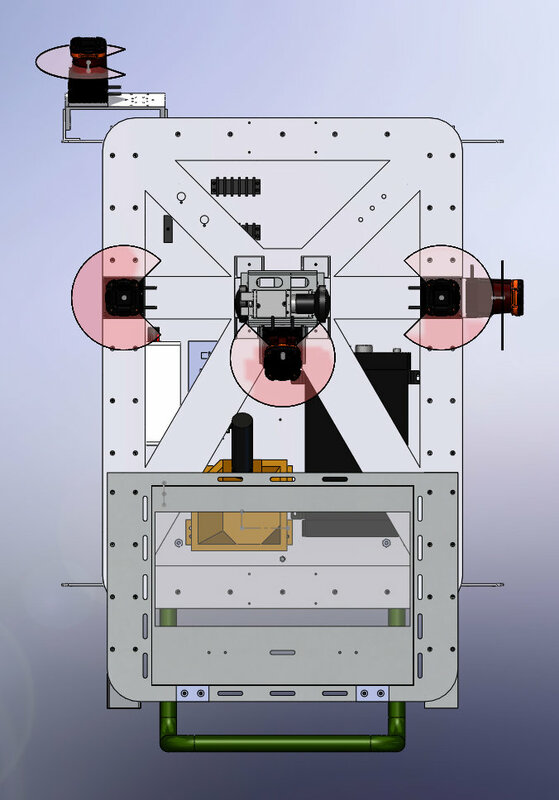 As an offshoot of this project, I developed a smaller version of this system for a rover platform which processed the sensor data online, performing localization, point cloud reconstruction, and plane fitting. This was developed for the Army Research Lab. This is my master's thesis work, titled Pose Estimation Using Starfield Occlusion. I developed a novel localization method for a rover in a polar lunar crater where there the only external navigation reference is the starfield and a gravity reference. I propose a method by which the occulsion of the starfield by the crater walls provides fast global localization estimates and explore the method in simulation. This effort, in conjunction with the Penn State Electro-Optics Center, was to build and field test a multi-laser light striper system, capable of integrating vehicle pose information to generate terrain maps. A light striper is a structured light sensor which uses a camera to detect the line generated by a laser. By means of triangulation, (implemented as a homography transform) the position of the points along the laser line can be determined. This data is much like the data returned by a scanning lidar system (e.g. a SICK), however without the need for a scanning mirror, reducing power consumption and mechanical complexity. For this project, I developed simulation software to analyze the configuration space of the sensor, as well as field testing the sensor and analyzing the data. 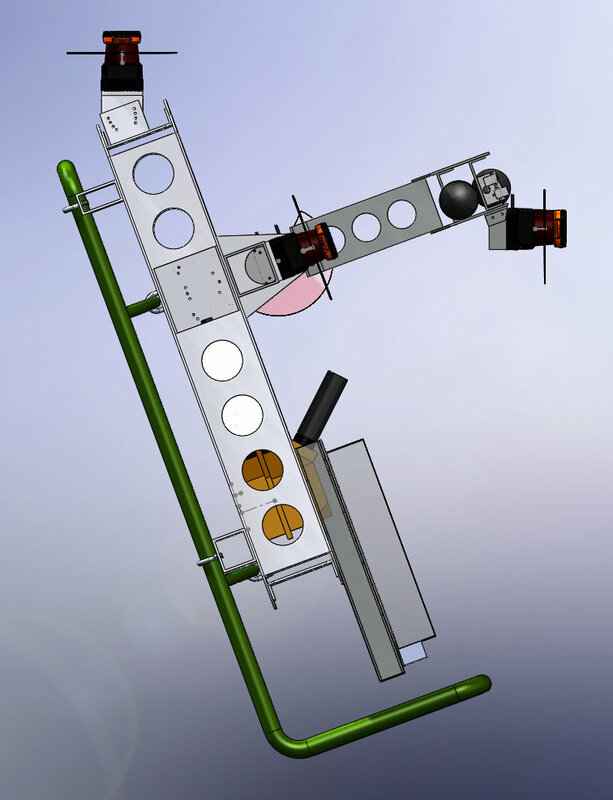 This class project, for 16-711 Kinematics, Dynamics, and Controls, was to develop a counterbalanced arm capable of balancing and picking up objects. I was the electrical and software lead on this project, developing the embedded controller software. It has long been theorized that water ice from cometary impacts are stored in craters at the poles of the moon. If it exists, this would be a highly valuable resource as it could be used for human consumption, as well as for fuel. While some evidence of these ice deposits have been found, it is not definitive. In order to confirm these deposits and determine their location, missions have been proposed to explore these craters. Scarab is a prototype rover for this mission, built by Carnegie Mellon for NASA. This rover demonstrates the ability to carry and deploy a one meter long sampling drill under strict power consumption and mass restrictions. I was a part of the project during the initial design discussions as the requirements and rover concept were hammered out. Part of my work was to develop a sensor plan for the rover. In the fall of 2007, I got an iRobot Create platform for my birthday (Thanks Dad!). I'm hoping to add sensing and computation to this robot and do some cool stuff. We'll see how that goes. This was a class project for ECSE-4962 Control Systems Design during my undergraduate. My team developed a robot that would toss a ball from one end of a beam mounted on a pan-tilt base, track the ball with an overhead camera, and catch it with the other end of the arm. The effort spanned a wide range of including controls, vision, system identification and modelling. A video of the system in operation is here. The final report here, and the presentation here.